Computerized Adaptive Testing (CAT) is a form of assessment in which administered items are selected based on the ability levels of the students. Initial item selection is typically based on the assumption that the test taker is of average ability; subsequently selected items are based on ability estimates obtained from preceding responses. This approach optimizes precision by increasing the selection of items that are neither too easy nor too difficult. CAT is efficient and quickly identifies gaps in student learning. Even better is the fact that ATI automates the construction of computerized adaptive tests. Tests are generated by ATI from an Assessment Planner that defines the item pool to be used in selecting items for the adaptive assessment. Automated construction provides ATI the capability to generate customized computerized adaptive tests to meet unique district needs. The Galileo Computerized Adaptive Testing Pilot is an integral part of ATI’s next generation comprehensive assessment system and is completely integrated into ATI’s Galileo K-12 Online Instructional Improvement System. Adaptive assessments serve many purposes including guiding instruction, monitoring progress, screening, and assisting in placement decisions. Integration within Galileo ensures that teaching staff and administrators have easy and rapid access to the full range of innovative assessment, reporting, curriculum, and measurement tools provided all within one system. ATI’s comprehensive assessment system is part of our ongoing commitment to continuous innovation so that school districts and charter schools can continuously build their own capacity to lead change in ways that enhance the quality and impact of education on our nation’s children and youth. ATI's approach to Computerized Adaptive Testing is discussed in greater depth in Composition of a Comprehensive Assessment System. • Colorado Association of School Boards (CASB) 71st Annual Conference December 8 through 11 at the Broadmoor Hotel, Colorado Springs, Colorado. • Arizona School Boards Association (ASBA)/ Arizona School Administrators (ASA) 54th Annual Conference December 15 through 16 at the Biltmore Conference Center, Phoenix, Arizona. In an earlier post, I discussed some key benefits of cloud-based services, or Software as a Service (SaaS). While the benefits are significant, there are risks that must be considered when making decisions about SaaS. Security Hardware: Security hardware includes firewalls that filter network traffic to (and from) application and data servers and inspect each packet for a threat, dropping traffic when a threat is present. Another effective type of security hardware is load balancers or cache engines that offload direct access to application servers and prevent operating system exploits. Security Software: The baseline of any effective secure software environment includes up-to-date operating systems on all application and data servers. Microsoft revealed in the first half of 2011, less than one percent of the exploits discovered took advantage of a “zero day vulnerability” (one that had not yet been patched by the vendor). This means over 99 percent of the attacks were preventable merely by maintaining well-patched operating systems and software. Also falling in the category of security software is the antivirus and computer security software suite. Finally, effective use of change management software can help SaaS Information Technology (IT) staff informed about any attempts to alter the application server environment without their knowledge. Secure Network Architecture: A well-designed network for any application-hosting environment includes segregation of application and data servers. This can be achieved by physically segmenting traffic or using a combination of segmentation and security hardware. Data Encryption: Encrypting the transport of data from the service vendor to the client system is critical. The current best practice for Secure Sockets Layer (SSL), Transport Level Security (TLS) is to employ a minimum of 128-bit encryption. Physical Security: An easily overlooked security concern is the physical environment of the service provider. Are application and data servers housed within a secure environment, and is access to the environment regulated by the vendor? Physical controls include personnel monitoring, multi-factor access authentication, external monitoring and other types of surveillance. Hierarchical - Such as the user account structure employed by Galileo Online IIS. Users are allowed access to increasing levels of information dependent upon the scope of the user account. Access-based - A flatter model such as that employed by Google Documents. Discrete permissions are assigned to individual data objects on a per-user, or per-group, basis. User privileges can be managed effectively and in some cases there is even benefit to a separate permissions structure because individual changes can be managed by the users of the system instead of having to rely on technical staff to implement changes. Do you have other concerns about data access protection that haven’t been covered? In a future post I’ll consider another risk area presented by use of cloud-based services and address how vendors are overcoming those challenges to create safe, effective environments for their clients. Nested within the Aggregate Multi-Test Report and the Benchmark Results Report is one of Galileo’s most powerful tools for intervention: The Benchmark Profile. The goal of the Benchmark Profile is to provide a detailed plan for moving an individual student or entire risk group to the next level of risk assessment. • Each standard will appear along with the probability that the student has mastered that standard, and their average score on questions covering that standard (Student Benchmark Profile only). 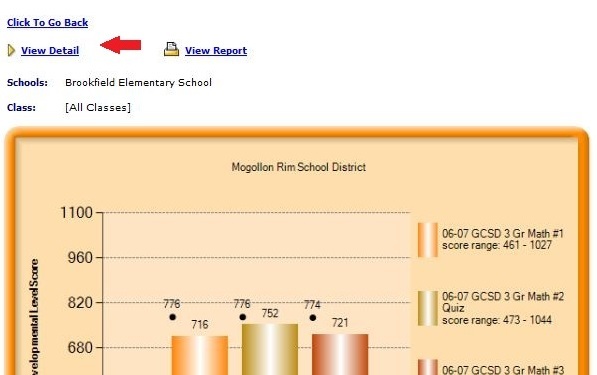 • Every student’s Developmental Level Score (or average for the group) as well as the cut score for each benchmark is displayed at the top of the profile. • Profiles will continuously update after each assessment to give you a current view of student progress. • Links to schedule Assignments and Quizzes directly from the report (Group Benchmark Profile only). • Despite the fact that it may not look like it, everything on the next page will be linked. You can select the School/Class or Risk Category to see a list of students contained in your selection. 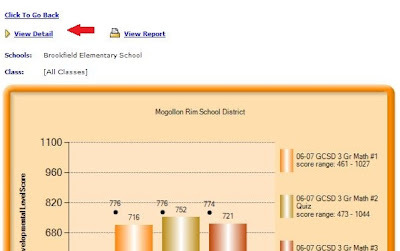 • By selecting a student you will bring up that individual’s customized benchmark profile.